Tropical storm Emily, the fifth named storm of the Atlantic hurricane season, may have dissipated for now, but itÃ¢â‚¬â„¢s important to remember that weÃ¢â‚¬â„¢re approaching the peak months for storm activity. NOAAÃ¢â‚¬â„¢s Climate Prediction Center yesterday issued its updated 2011 Atlantic hurricane season outlook, raising the number of expected named storms from its pre-season outlook issued in May. The confidence for an above-normal season has increased to 85 percent, from 65 percent in May. The Atlantic basin has already produced five tropical storms this season: Arlene, Bret, Cindy, Don and Emily. Tropical Storm Don quickly disintegrated after making landfallÃ‚ in southern Texas July 29. The 2011 Atlantic hurricane season officially begins Wednesday and so far all signs point to above-average activity. But as the Palm Beach Post’s Eye On The Storm blog recently pointed out: all hurricane seasons are active, as attested byÃ‚ last year’s 19 named storms, 12 hurricanes and 5 major hurricanes. That said, inÃ‚ its just-released pre-season forecast, London-based consortium Tropical Storm Risk (TSR)Ã‚ is stickingÃ‚ to its April prediction for 14 named storms, with seven to eight hurricanes and three to four intense hurricanes (Category 3 to 5). TSR expects the 2011 season will see activity about 25 percent above the long-term (1950-2010) norm. Just last week the National Oceanic and Atmospheric Administration (NOAA) predicted the 2011 season would see 12 to 18 named storms, of which six to 10 could become hurricanes and three to six major hurricanes. The last time a major hurricane (Category 3-5) made landfall in the U.S. was in 2005, but itÃ¢â‚¬â„¢s been only three years since Hurricane Ike, which ranks as the third most costly hurricane in U.S. history. If you want to compare the views of the major forecasters, Guy CarpenterÃ¢â‚¬â„¢s GCCapitalIdeas blog has a summary of the latest predictions. Many, including Colorado State UniversityÃ¢â‚¬â„¢s Tropical Meteorology Project, will issue updated forecasts next week. Early 2011 Atlantic hurricane season forecasts are coming in and based on the latest information it appears we can continue to expect above average activity when the season gets underway June 1. HereÃ¢â‚¬â„¢s a glance at how they stack up. Forecasters at the Colorado State UniversityÃ¢â‚¬â„¢s (CSU) Tropical Meteorology Project are predicting 16 named storms, with 9 hurricanes and 5 major hurricanes (Category 3-4-5). They are also calling for above average chance that a major hurricane will make U.S. and Caribbean landfall. London-based consortium Tropical Storm Risk is calling for 14 named storms, with seven to eight hurricanes and three to four major hurricanes. TSR forecasts Atlantic basin and U.S. landfalling tropical cyclone activity at about 25 percent above the 1950-2010 norm. Accuweather.com Hurricane Center meteorologists are also predicting an active season for 2011, with 15 named storms, eight of which are expected to become hurricanes, with three major hurricanes. They also expect more impact on the U.S. coastline than last year. For insurers these early forecasts give a general idea of whatÃ¢â‚¬â„¢s to come, but of course, itÃ¢â‚¬â„¢s still very early days. Check out I.I.I. hurricane facts and stats. In all, insurers have paid out nearly $380 billion in catastrophe losses (adjusted for inflation to present day dollars). 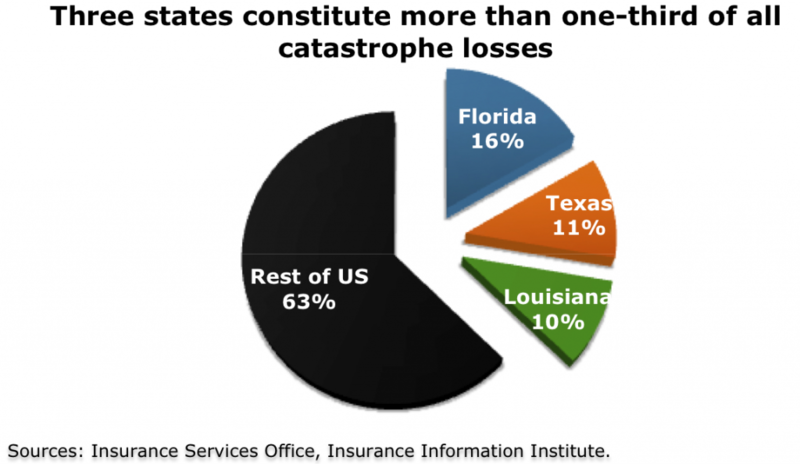 Three states – Florida, Texas and Louisiana – make up more than a third of that number – driven largely by hurricanes. A change is as good as a rest, or so the saying goes. After four years blogging on a near-daily basis IÃ¢â‚¬â„¢ll be taking a short break. To my loyal readers, the good news is that while IÃ¢â‚¬â„¢m out Terms + Conditions blog will continue under the able penmanship of Jim Lynch. Jim is an actuary AND a writer, so follow what he has to say closely and know that he has the numbers to back up his words. We have a lot to look forward to when I return to the blog in April. By then the 2011 Atlantic hurricane season will be just two months away, and by all accounts itÃ¢â‚¬â„¢s shaping up to be another busy one. For now, take a minute toÃ‚ watchÃ‚ a recap ofÃ‚ the 2010 hurricane season in this YouTube video, courtesy of Discovery. See you in a few weeks!